A recent crafting challenge was all things vintage. It was difficult to settle on just one project. There was my stash of skeleton keys begging to be made into more jewelry and 40 year old Dresden paper scraps perfect for cards and scrapbooking. but it was the giant box of Paternayan wool yarn that called to me. I inherited it from my aunt who was an avid stitcher and rarely seen without her "work." The colors are rich and vibrant, reminding me of her different projects. She always purchased a little extra to be sure she had enough of a certain dyelot. I needed some coasters, so I chose 3 colors and got started. I wanted a coaster that was 3.5"x3.5", so I cut a piece of canvas that has 24 holes x 24 holes as 7 holes = 1 inch. 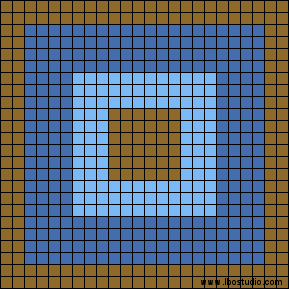 Inspired by the paintings of the famous Bauhausarist Josef Albers, I designed my pattern. I threaded the needle and began stitching with the darkest color first, in my case it was brown. I used the continental tent stitchthroughout the piece, preferring to work in concentric squares rather than row by row. When I needed to start a new color, I tucked the tail of the old color into the back of the stitches prior to moving on to the next color. The process of starting a new color is similar to ending the previous one. 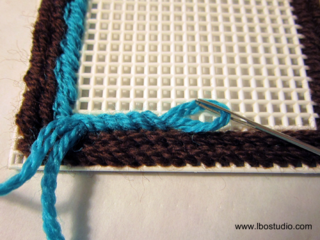 You simply pull your tail through the back of the stitches, pulling your needle out where you want to begin. Note, when first starting, you don't have any previous stitches in which to tuck in your tail's end. 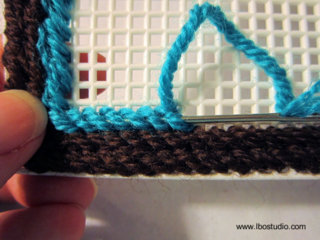 You can do so later using the same procedure for ending a color or work your stitches over it as you go. Once you have completed the pattern and tucked in all ends, you will still need to stitch over the outer edge of plastic. I used a light color whipstitchingover the edge, giving the work a finished look. As you've worked the stitches in the continental tent stitch, the back of work will be equally coverd, adding a second layer of protection between your hot mug and the table top. You have enough plastic to make 4 coasters. Make a matching set or have fun experimenting with color! Make them for a Christmas or hostess gift.